today, Jagai and Madhai aren't exceptions, they're the rule. You are that sena-pati-bhakta forecast to appear. In this world, to Sri Nitai, how could someone be more dear? 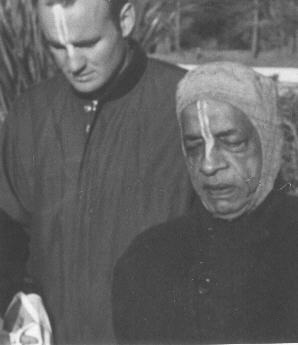 Gauranga's mighty weapons in His sankirtan regime. You launched this sacred arsenal throughout our sorry sphere. In this world, to Gauranga, how could someone be more dear? a taste you knew could also make the troubled heart transform. "Seek out Sri Radha's grace," you urged, en route to Boston's pier. In this world, to Sri Radha, how could someone be more dear? "their love for sense enjoyment is exceptionally strong." And yet, for Him, you came to me and boldly interfered. In this world, to Lord Krishna, how could someone be more dear? the Rathayatra fest began, a boon to every heart. You blessed a hundred cities with its blissful atmosphere. In this world, to Lord Jagannath, could someone be more dear? he surely will be tested as severely as Prahlad. You thus left us the Deity who mitigates all fear. In this world, to Nrsimhadev, could someone be more dear? until you smashed the barricade and laid the pathway clear. In this world, to your guru, how could someone be more dear? the Buddha and the Prophet, too, find chaos masks their words. But you left us your lawbooks with a message crystal clear. In this world, to your follower, could someone be more dear? that anyone who listens savors krishna prem in time. 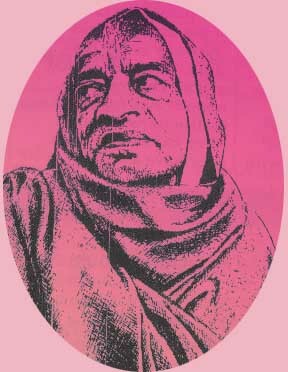 Srila Prabhupada, your favorite color is blue. 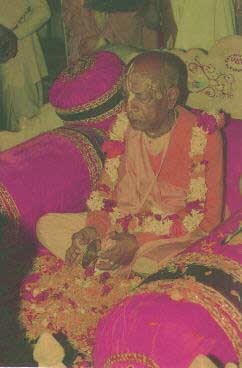 Srila Prabhupada, our past material existence is just a blur. Srila Prabhupada, to you we surrender, today and tomorrow. Srila Prabhupada, you gave us new life. Srila Prabhupada, that's why we call you Your Divine Grace! 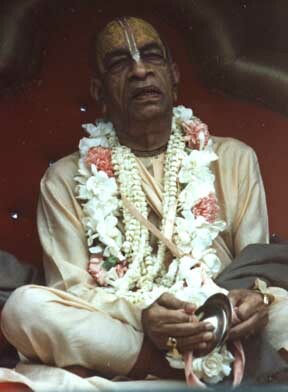 Srila Prabhupada, other than your ISKCON shelter, we have never pondered. If love is blind, why do I still see Maya's face? My sins are many, senses are wild, I'm a disgrace. 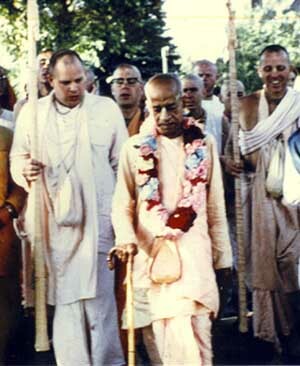 Srila Prabhupada, on love's path only you can guide us. 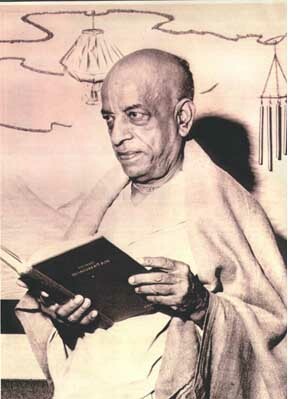 Srila Prabhupada, we'll make you feel proud, right? in holy service strong and pure. to share the autumn of his life. accepted by the Western youth. his body died, his soul took flight. Why wait for winter's ice and snow? The autumn is the time to go. a flitting tribute for the dead. our sorry plight and set us free. Bow wow bow down now. as your special mercy sprinkled throughout this land. ...you exceed all definitions of ecstasy! my life airs are contingent upon your sweet impartiality. in this precious exchange of Krishna Bhakti. you tolerated within this Mrtyu-loka sea. All the tears I've cried equal but a drop from your waters of charity. Only a pure soul as you could withstand such intense austerity. in the confidential folds of your prema manjaris. crystalline encrusted particles of separation from the Proprietor of All that Be. streaming from your divine personality? the nectar blossoms from your gardens of spirituality? necklaces unto thee is drenching my consciousness in waves of incredulity. 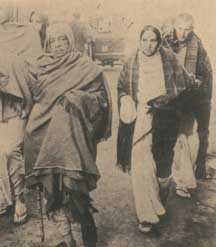 Prabhupada, please forever churn me in your mead of love for Gaurahari! 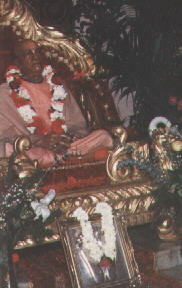 Abhay charan Bhaktivedanta Srila Prabhupada. What can poor poets say in a few words about His Divine Grace? who brought the great treasure of Krishna prem! What can we say in a few words about our gurudeva? as to spread in every town and village the chanting of the Holy name. What can we say in a few words to magnify your fame? back to the lotus feet of the Lord of the universe. guide us back to the portals of Goloka’s paradise. giant among theistic publishers, was never seen in the history of publishing! purports destroy the darkness of a purportedly lost humanity! 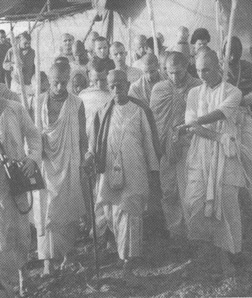 the sankirtan movement of Gaudiya. 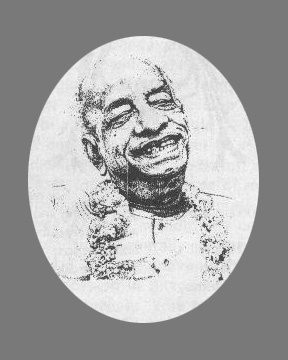 What can we say in a few words about Srila Prabhupada? What can we say about him, our eternal Sat guru? our thoughts, our lives, our hearts, and indeed, the mantras he taught. us free from death’s rank of mortals . He gave and gives us immortality, knowledge, joy! the custodian of the greatest multi-lingual spiritual library. 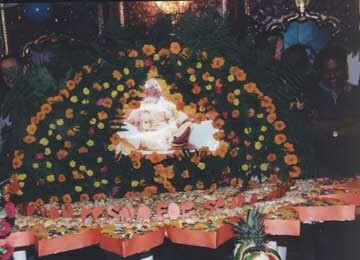 Jagat Guru, guru of the universe. by thy love, even God is controlled. who is considered Lord Vishnu's pure ray. just drowning in sorrow's sea. without thy mercy I endlessly fumble. the perfect light for alll we do. in a world all gone corrupt. you made a home, all can live. by hearing all you speak. and that preaching, is like a knife. let God's names be always heard. to bless all who are seeing. and therefore have all gone wild. each gopa germ and king of the downtrodden. to stop Gaura's tears like storm water. by preaching the glories of hearing God's names. just what is our very greatest privilege. to sing God's names, in Krishna consciousness. 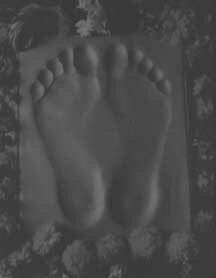 to follow the footprints of every pure sage. or follow thy ugly pride. you are most greatly blessed. so I may walk with you, and with you assist.